Just this morning, the Reserve Bank of Australia released the minutes for its latest monetary policy meeting. The minutes revealed that the RBA’s main reason for its rate hike in the April 6 meeting was the unexpected demand for Australia’s commodities. They believed that income levels are starting to rise, which could push inflation to unwanted levels. Like their previous monetary policy statements, the RBA remained hawkish as ever. In their policy meeting last March, RBA officials noted that strong inflationary pressures justified their moves to bring interest rates back to normal levels. But back then, they pointed out some risks to the Australian economy, such as global fiscal concerns, and mentioned that tightening would have to be conducted at a gradual pace. Taking a look at price action on Aussie pairs, we can see that risk sentiment still plays a major factor in the currency markets. As I mentioned in my post yesterday, once news about Goldman Sachs fraud case hit the airwaves, widespread risk aversion caused the Aussie to dip versus the dollar and yen. After gapping down to start the week, the Aussie has bounced back against both currencies prior AND after the release of the minutes early today. It seems that people remain very optimistic for the Australian economy and that traders will continue to buy up the Aussie whenever positive data comes out. Looking ahead, the combination of the RBA’s upbeat outlook and high interest rates could push the Aussie higher over the next couple of months. Technically, the AUDUSD is still on a strong uptrend that started all the way back in March 2009. Given the pair’s present trend, it looks like taking out the 0.9400 handle, which is the pair’s two-year high, isn’t too far off. In case that happens, look for the pair to crawl to the 1.0000 milestone. 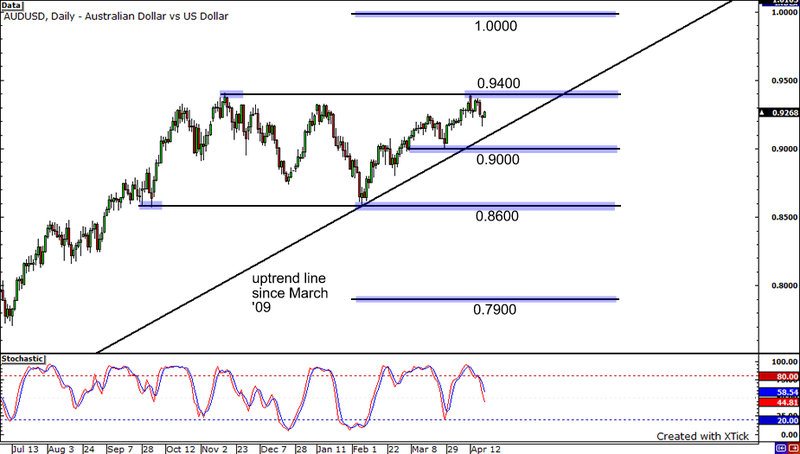 A not-so-good scenario for the AUDUSD is a break in its long term uptrend line. If that happens, the next important levels to watch are the following: 0.9000, 0.8600 and 0.7900. I’m no forex fortune teller, but based on the fundamentals and technicals, I’m going to get out of the limb and say that that there’s a good chance that the Aussie could reach dollar-parity!